Map of the United States and Alaska showing 8 regions (separated by bold dashed lines), evaluated areas (bluish gray) that were not assessed and 36 areas (pattern) that were assessed by the U.S. Geological Survey for carbon dioxide storage. Regions and study areas are plotted over a shaded-relief image showing higher elevations in brown and tan and lower elevations in green. In a policy address last week, President Barack Obama made the reduction of greenhouse gas emissions in the United States a key priority in the nation's fight against climate change. Now, a newly released geological report points to a promising way to cut down on the amount of harmful carbon dioxide pumped into the atmosphere: inject and store it inside rocks deep underground. 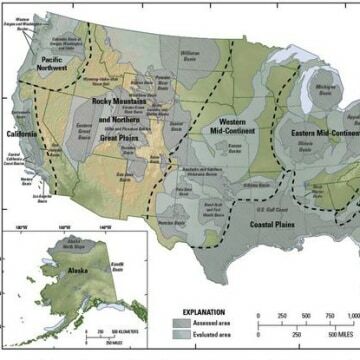 The U.S. Geological Survey (USGS) conducted a detailed assessment and found 36 regions across the country that have the proper subterranean conditions to store between 2,400 to 3,700 metric gigatons of carbon dioxide underground — a process known as geologic carbon sequestration. One metric gigaton is equal to a billion metric tons. In a separate report released in early June, the U.S. Energy Information Administration, an organization that collects and analyzes statistics on energy production and consumption, projects the United States will emit approximately 5.4 metric gigatons of fossil fuel-related carbon dioxide in 2013, which includes coal, natural gas and petroleum emissions. Based on these estimates, the USGS findings represent a vast, untapped resource that could help reduce carbon dioxide emissions and mitigate the impact they have on Earth’s climate, said Briana Mordick, a geologist at the Natural Resources Defense Council (NRDC), a nonprofit environmental advocacy group headquartered in New York City. As part of its survey, the USGS excluded areas of the country that are considered freshwater sources, and limited their assessment to rock layers at depths at which the carbon dioxide would be under sufficient pressure to remain in a liquid state, which would help the carbon dioxide mix in with the briny water found underground. The study identified the largest storage potential in the Coastal Plains region, which encompasses much of the Gulf Coast. This area could account for roughly 2,000 metric gigatons, or 65 percent, of the country's storage potential, according to the USGS report. Other areas with considerable storage capacity include the Alaska region and the Rocky Mountains. Geologic carbon sequestration involves capturing the exhaust gases from power plants before they are released into the atmosphere, and separating the carbon dioxide from the rest of the emissions. This carbon dioxide is then cooled and compressed into a so-called supercritical state, which means it has properties between a liquid and a gas, Mordick explained. Next, the supercritical carbon dioxide travels through a network of underground pipelines to a site where it is pumped through a well into subsurface rocks. "The idea is that the carbon dioxide will be trapped there pretty much indefinitely," Mordick said. "Things like oil, gas and brine are trapped in the subsurface for millions of years, so basic geologic principles tell us this is possible. In some ways, it's mimicking natural geologic processes." "You want a rock that has what we call porosity, which means there are small, open areas within the rock, and permeability, which is the ability for fluid to move through the rock," Warwick said. Sandstone or limestone rock formations are particularly good storage reservoirs, but equally important are the layers of rock over the top that act as a cap, sealing in the carbon dioxide, Mordick said. Without this robust rock layer, carbon dioxide could seep out and leak to the surface, reaching the atmosphere anyway. "There has to be a good ceiling formation above — something like shale, with low porosity and low permeability," Mordick said. "Essentially, it's like a lid on top of the storage formation that prevents carbon dioxide from migrating vertically." Leaks are one of the primary concerns surrounding geologic carbon sequestration, and researchers around the country are assessing the risks involved, which includes studying the types of conditions that could cause carbon dioxide to escape. One possible way the gas could escape is by seeping into a shallower rock formation, where it might then spread and eventually make its way to the surface, said Ronald Falta, a professor in the Department of Environmental Engineering and Earth Sciences at Clemson University in Clemson, S.C. In 2009, Falta and a colleague, Larry Murdoch, received an $891,000 grant from the Environmental Protection Agency (EPA) to research how to safely store carbon dioxide in geological formations. The project, which also involves Sally Benson, director of Stanford University's Global Climate & Energy Project, is in its final year. Falta said that while leaky carbon dioxide is a major concern, the idea of storing material in subsurface rocks is a well-understood process. "People have been storing natural gas in underground formations for years with very few problems," Falta said. "If these sites are studied carefully, and if they're deep enough, I think the risk is low. But, it's still a major issue that we're going to have to address before anything is done, while the carbon dioxide is being injected, and after it's injected. We need to think: How do we safeguard against leaks, and what are we going to do if it does?" 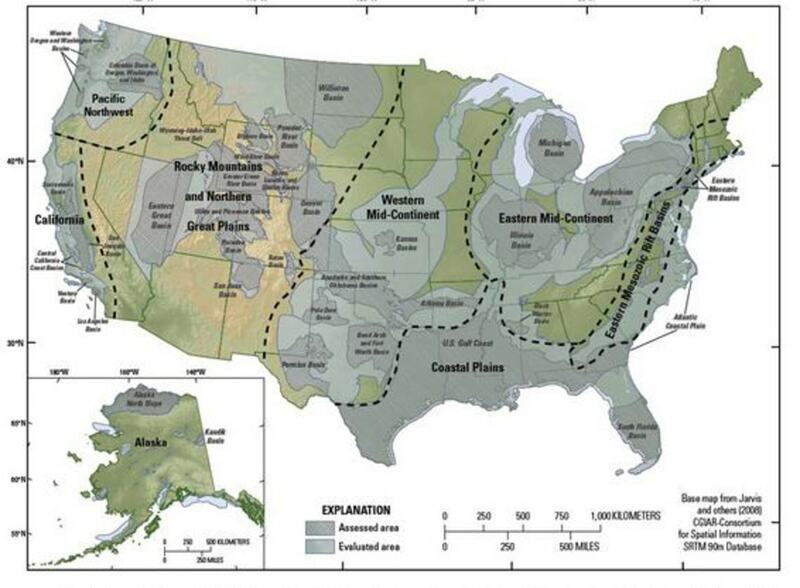 Geologic carbon sequestration is currently regulated by the EPA, under its Class VI rules for injection wells. Under these rules, companies or organizations are required to monitor the site for leaks for at least 50 years after the injection process. Mordick, at the NRDC, said the Class VI guidelines are the most stringent rules the EPA has written, and they are designed to regulate the entire sequestration process, from the selection of the storage site to the decades following. Falta said that over time, different trapping mechanisms will naturally help contain the carbon dioxide (CO2), but monitoring how the carbon dioxide initially moves through the limestone or sandstone rocks will be critical. "Carbon dioxide dissolves in water under those high pressures, so eventually it's all going to dissolve and not have a tendency to rise," he explained. "Over longer periods, it will turn into minerals and carbonates, so it's mostly in the early periods, when you have a buoyant plume of CO2, that you have to be really careful." "It's really expensive to separate the carbon dioxide from the flue gasses coming out of the power plants," Falta said. "That's where the major cost is going to be, and it has been done at small and medium scales, but not at the massive scales that we might be talking about for large power plants." Warwick said the USGS intends to publish a follow-up report on the economics involved with geologic carbon sequestration, based on the results of their initial study. "There is a significant buy-in, so all this development and infrastructure comes with a cost," Warwick said. "If you're willing to pay for the cost to capture CO2 and put it into the ground, then it could make a significant impact." The USGS is also investigating other risks involved with injecting carbon dioxide deep underground, including whether this process could induce unwanted seismic activity, Warwick added. Injection of waste water from fracking, or hydraulic fracturing, has been linked to increased seismicity in areas where the injection occurs. Still, geologic carbon sequestration represents an enticing way to reduce the nation's amount of greenhouse gas emissions, Falta said, and an opportunity to lessen the environmental impact of coal-fired power plants. "The U.S. has more of these rock formations than any other country, and more than any other continent, so in that respect, we're kind of lucky," Falta said. "It will probably boil down to a question of economics. Will people think it's worth it to do this, or should we continue to use coal? And we have a lot of coal, too."